Irene Waters’ “Times Past” prompt challenge topic for this month is: Horses and Childhood Dreams. I am a baby boomer; growing up in the USA suburbs. Houses lined up one after the other in my neighborhood; no farms or horses. I never dreamed of having a horse. None of my friends had horses. The only animals I was familiar with were dogs and cats. Family pets. Horses existed on television shows like Mr. Ed, Bonanza and Lassie. Mr. Ed was my personal favorite! I went on pony rides at county fairs, although they made me uncomfortable. I was sad to see ponies trudging endlessly in a circle. They looked trapped. My first memory of anything horse-like was a red wooden rocking horse. A gift for my 2nd birthday. I apparently rode it with great abandon, springs squeaking in a steady rhythm. The springs were my favorite part – more bouncing up and down. I was a very active kid so it doesn’t surprise me. I will admit that some of this memory is from an old 8mm (silent) home movie – close to 3 minutes of me energetically riding my first “horse.” Somehow I do remember the squeaking. Perhaps from my younger siblings years later. I went horseback riding once – at Girl Scout camp. It was a big deal because it cost extra. The horse took off galloping and I didn’t know what to do. Painful. So…I am one of those exceptions to the theory that all girls dreamed of horses. I actually dreamed of flying! For years it was how I fell asleep at night as a young child – starting up the dream as I closed my eyes. Run, jump and up I went. But that’s another story. Irene Waters’ “Times Past” prompt challenge topic for this month is: Bicycles. I remember always having some type of 2 or 3 wheeled transportation to call my own when I was a kid. I started off on a tricycle and stepped up to a “big girl” bike around the age of 5 or 6. Pink, with coaster brakes and a loud horn, this bike was my ticket to freedom – once I fully learned how to stop…. My most vivid bicycle memory is the day my father removed my training wheels. I started pedaling in front of our house – at first wobbly – but with my father’s hand steadying the back I managed to remain upright. I picked up speed as I – by myself!- headed toward the end of the street. After flying by 2 or 3 houses I realized I had absolutely no idea how to slow down and stop. Either nobody told me it was the same as with the training wheels or I simply forgot. Brain cramp. So what did I do? I clearly remember the heart thudding moment-of-panic as I made a split second decision (perhaps my first and that’s why I remember it so well). I steered into the curb and fell over onto the asphalt. Nothing broken. Just a few bumps, scrapes and bruises. Lesson learned. Despite my early braking mishap, I absolutely loved riding a bike and rode with no fear. When I outgrew (or wore out) the pink one, I got a bigger white bike in the 5th grade. Coaster brakes again. In those days, still no helmet. Despite the fact that my father kept accidentally bumping his car into my “new white bike” (as noted in my diary) it lasted quite a few years. The garage was small for a car plus multiple bikes. There were 4 kids by then. When I was 10 and 11, I often rode to the small grocery store/strip mall that was 6+ blocks away. Errands for my mother or to get bubble gum and comics for myself. Or sometimes to sample all the perfume spray testers at the drug store with my girlfriend Kathleen. It was mostly downhill from my house. I’d start at our backyard (which bordered another backyard) and take off bumping over grass, tree roots, gravel and into the neighbor’s yard in back. I’d jump the bike over their curb and into the street, turning right. Zooming past about 4 houses, I turned left and then…the best part – a hill straight down bisecting at least 4 streets on the way to the main road and my destination…the Acme! The drug store! My hands flung out to the side. Feet off the pedals. The wind. Nothing like it before or since. Sometimes I’d shut my eyes for a second or two. Riding back home…uphill…was another story altogether; but totally worth it. Bike riding was crucial to my quest for exploring the vast suburban wilderness. The many blocks to the candy store, the woods at the end of the street, my friend Kathleen’s house two blocks away. My parents didn’t and couldn’t track me. “Be home by….” was all the direction I got. Priceless freedom. When I neared the end of high school, I saved up and bought a “folding” bike which I brought to my summer job at a camp in NH. It saved space during travel and was fairly simple to store. I also brought it with me to college where I rode it from one end of campus to the other. Since my first car took center stage after college graduation, I sold my folding bike and moved on. As an adult – in my late 30’s or early 40’s – I owned a bike again. I wore a helmet. I rode it around the rural neighborhood street where we were raising our kids. Around and around. Kind of boring. I was no longer as fearless. And what’s with the hand brakes?? The biggest change I notice in my lifetime…so far…is the way we communicate. When I was growing up (in a United States suburb) we talked to each other more directly. All the time. In our homes. In school. On the playground. On the street. Whether we liked it or not, we needed to listen. If we didn’t talk, either in person or on the phone, we wrote notes or letters – by hand. As a very young baby boomer, I grew up in a household with a landline and several telephones. One phone was attached to a kitchen wall with a long coiled handset cord; which allowed my mother to talk to her friend down the street, make a casserole, wipe counters and watch out the back window to check on her wild children chasing each other in the yard. There was another phone in my parents’ bedroom, plugged into the wall with a cord. We had one phone number – which only changed when we moved. It was our main means of immediate communication. At first we had rotary dial phones. Each numeral of the phone number had to be dialed – actually dialed – and it probably took 10 seconds to place a call depending on the number. Which gave you time to change your mind if need be – or think more about what you were going to say. When we changed to “touch tone” phones, it was a big deal. As I got older, “my own phone” always topped my birthday list. As the family grew larger, so did the number of phones. We could all pick up the various phone extensions and share conversations with grandparents and friends. Now, with cell phones, that’s not possible – unless you crowd around a phone while on speaker. Less private and less intimate. If I wanted to tell a girlfriend my latest news, I would call her. She would call me. We talked for a few minutes or an hour. No answering machines – if I wasn’t home, I missed the call. Making a long distance “toll call” cost extra. If a local friend moved – even just a few towns away – we switched to writing letters. And patiently waited for the post office to send our letters back and forth. Penmanship was an actual subject in grammar school – we all learned “cursive” writing soon after learning to print. I had to practice the fine art of slanting each letter the right way and crossing the “t” just so. Over and over. We were graded on penmanship in quarterly report cards; which was always my downfall. I think I was in too much of a hurry. My penmanship always “needed improvement.” The only behavior issue…”refrain from excessive talking”…. When I spent summers at overnight camps (either as a camper or a counselor), dozens of letters went back and forth with friends and family. I also saved dimes, nickels and quarters (or called “collect”) to use a pay phone to call home every so often. The sound of a human voice always made a difference. I could pick up on the nuances of tone and emotion in my mother’s voice, for example, which added an extra dimension…one way or the other…to the conversation. I could sense when a friend said she was “okay,” that maybe she really wasn’t — something I could only tell by hearing her voice. “What?” I might ask. “What is really going on?” When I lived in a dormitory at college, my roommate and I shared one phone. Also attached to the wall. Now it’s texting or quick calls while en-route somewhere else on static filled speakerphone or bluetooth connections. Conversation is condensed, nonexistent or limited to short bursts. Now, a friend or family member calling to ask “how are you?” is often replaced by a texted “how R U?” Or the cell rings and I hear a breathless “I’m about to get on the bus/subway/train. I only have a few minutes…what’s up?” Landlines allowed us time. And bullying by text is truly a more cowardly act than when it was face to face. 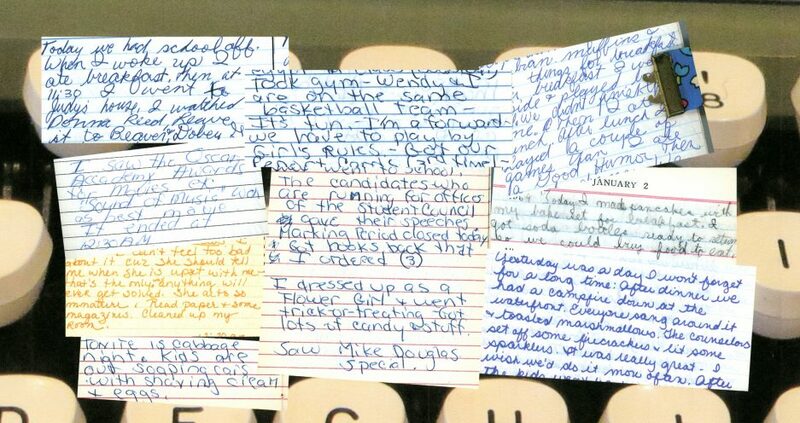 When I was a kid, the mean girls passed notes or used words; but it stopped at the end of the schoolyard. Texting meanness and tapping “send” is so much easier and so much more toxic. I am a baby boomer and grew up in suburban USA. What an interesting topic! I was the oldest of 5 kids. The kitchen table was the setting for most conversation when we were all together. It is where we ate all our meals (unless company was coming and then we used the dining room). The kitchen area was fairly small, so we were very crowded around the table and filled up the room. My clearest memories of “talk” at meals? My mother’s (and sometimes my father’s) voice: “Hold your fork correctly” (directed at my brother repeatedly), “Get your elbows off the table” (directed at all of us), “Chew with your mouth closed” (could have been anyone), “Remember only a clean plater gets dessert” (everybody). All that concentrating on manners may have prevented much talking about school, the weather or what was going on in the world. I do, however, recall a few exceptions. When I was in the 10th grade I learned how to dissect a frog in science class. That night at dinner I compared it to the chicken leg I was expertly cutting off the bone, carefully removing the meat and exposing the ligaments, etc. “Look! this looks like pipes and stems!” That did not go over well, as everyone promptly lost their appetites. I never lived that one down. And another time…right in the middle of dinner, my brother (I think he was 10 or 11 at the time) chose a quiet moment to look at one of my sisters and call her a douche bag. Any conversation ground to a halt. No fork correcting. Mouths, full of food, hung open in disbelief. Uh oh, I thought. Apparently he had just heard the term used in a derogatory way at school and was obviously quite proud of himself. “WHAT? ?” both parents shouted. “Do NOT Ever Say That Again.” And then…much to our surprise, my mother asked him…”Do you know what a douche bag is?” When it became obvious he had no clue, she (privately) explained exactly what it was. I think he was horrified. He never used the term again (at least at dinner) and reverted to more common insults that didn’t involve ladies’ private parts. The conversation drifted back to comfortable topics once again. “Put your napkin in your lap!” “Finish your milk!” “Say please!” Which was, perhaps, just as well. We all did grow up with excellent table manners.